"Pictorial Banners in the Edo Period"
Click HERE for many more photos ! !!!!! 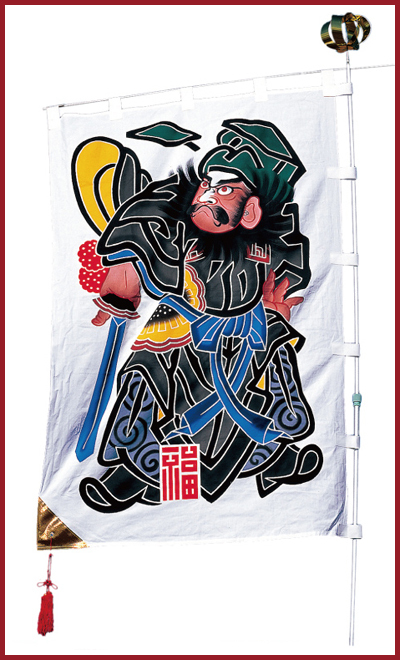 Shōki is the Chinese deity who protected Tang-era Emperor Xuanzong 玄宗 (Jp: Gensō, 685-762) from malevolent demons. According to this legend, Shōki appeared to the sick emperor in a dream and subdued the demons causing his sickness. In gratitude, the emperor awarded Shōki the title of "Doctor of Zhongnanshan" (Jp. = Shūnanzan-no-Shinshi 終南山の進士). By the way, Zhongnanshan 終南山 is the legendary birthplace of Chinese Taosim. It is here that Taoism's founder, Laozi 老子 (Jp. = Rōshi) reportedly gave classes and wrote the Taoist classic "Tao Te Ching." The sacred terrace monastery is called Louguantai 楼観台. Shōki wanted, above all else, to serve as a physician in the imperial palace, but when he failed the national exam he committed suicide in despair. Emperor Xuanzong heard this story, and in pity, posthumously awarded Shōki the title "Doctor of Zhongnanshan." Shōki’s spirit thereafter vowed to protect the emperor and empire from evil. 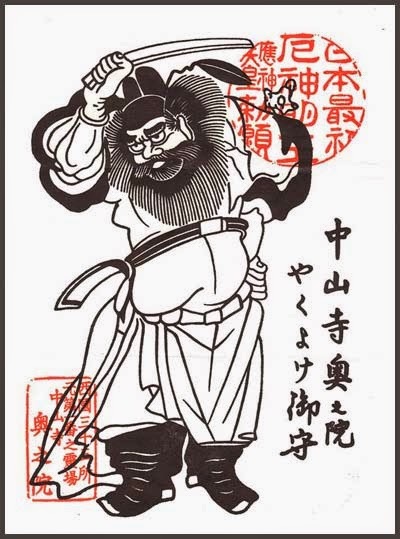 Shōki was a Tang-era physician in the Chinese province of Shensi, but he was very ugly. To advance his career, he took the national examination to enter imperial service, and performed brilliantly, scoring first place among all applicants. But when Shōki was presented to the emperor, he was rejected because of his ugliness, and in shame, Shōki committed suicide. Overcome with remorse, the emperor ordered Shōki to be buried in the green robe reserved for the imperial clan. In gratitude, Shōki's spirit vowed to protect the ruler and all male heirs from demons of illness and evil. Shōki’s popularity peaked in Japan during the Edo period, when people began to hang images of Shōki outside their houses to ward off evil spirits during the Boys' Day festival (Tango no Sekku 端午の節句, May 5 each year, but now a festival for all children of both sexes) and to adorn the eaves and entrances of their homes with ceramic statues of the deity. 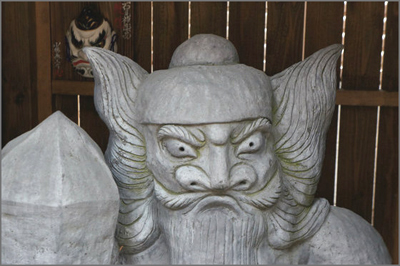 Today, Shōki is a minor deity relatively neglected or forgotten by most Japanese, except perhaps in Kyoto city, where residents still adorn the eaves and rooftops of their homes with Shōki’s effigy to ward off evil and illness, and to protect the male heir to the family. The mask of Shoki is an amulet made during the time when famine, loss of the silk worms and other disasters hit the region around 1850. Some villagers put the mask on and ran around, praying for help - and heaven sent help and a good harvest after all. Now people wearing the mask take part in the festivals of this and other shrines in Takahashi. Kazamatsuri 風（かざ）まつり Wind Festival, in April. 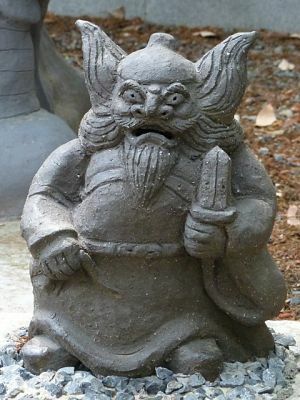 Many homes in Naramachi have a statue tile of Shoki sama on the roof. There are many old cemeteries in the village and many ghosts live there. Thus, a demon or ghost queller is most appropriate ! 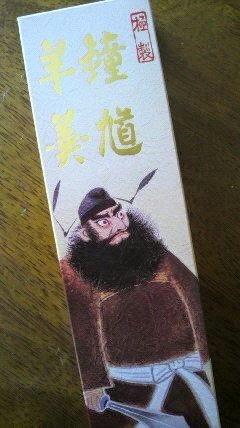 Naramachi is also famous for the red monkey dolls, migawari zaru. The Demon Queller is a folklore figure called Shoki in Japanese and Zhonggui in Chinese which originated in China around eight century. The Chinese emperor named him Demon Queller, after loyal Zonggui chased the ghost away during the emperor nightmare. This graceful emperor restored Zonggui honors, since Zonggui committed suicide, after he knew that his ugly feature was the cause of depriving his rightful honors in a civil examination. Images of Shoki in China, as well as in Japan, will be displayed in the fifth day of the fifth lunar months, when demons were thought to be especially troublesome. In Japan, the day marked the Tango-no-seku festival, now known as Boy's day. 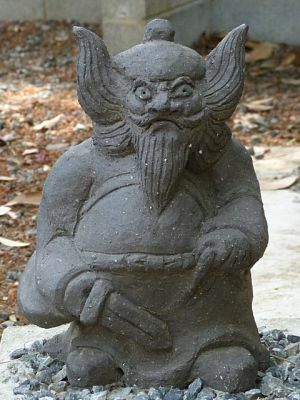 This Boy’s day is for the celebration day for healthy and successful future of male children.The picture shows the original statue of Shoki made by the Bizen stoneware. (Refer to Code 21-a for detail) of Bakumatsu (1854-67) to Meiji period (1858-1911) with no incense mark of potter name. It is quite old and is heavy and turned black by exposing to the stove for many years. 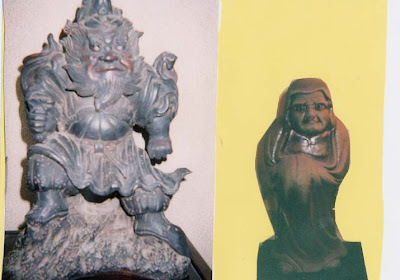 The picture is photo lighted and looks gray to show the texture but the real color is dark gray almost black which shows antiquities. Daruma ~(AD525), Indian monk (Bodhidharma) was the founder of the Japanese Zen sect of Buddhism, which survives today. He entered South China and taught meditation, such as deep penetration by sitting in front of the wall. Many different types of portraits of Daruma exist, all imaginary representations of the portraits based from the narrative accounts. 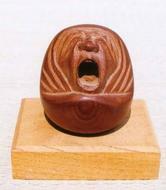 The picture shows original Bizen stoneware artist’s version of Daruma in the contemporary days of late Showa in the 1980s. Daruma is shown as standing and casting a concentrated stare with bulging eyes. He is clad as a monk, in a plain cassock with hood, and his arms are folded inside the robe. It is quite rare to see Daruma standing, since he is usually sitting down for meditation. Probably, the artist wanted to reveal the story told about Daruma strong will to cross the Yangze River in China, being unaccepted at first, and went north to MountSong, where he meditated for nine years facing the cave wall at the Sholin monastery. 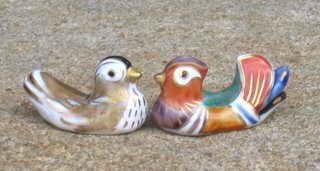 In fact there is a pair, man and woman. These statues protected the village from evil spirits, epidemics and other diseases and are well visited even today. In the nearby hamlet of Tsurugata 鶴形 there is a similar pair of these human-like statues. They are made from wood painted red (to prevent diseases) and have long hair. They both have a piece that looks like a long pipe (kiseru 煙管). Near the waist they have two swords and a bento lunch box 弁当箱. In May Shoki comes running down the mountain, carrying fire on his back. People have to celebrate the Seasonal Festival (fifth day of the fifth month, Boy's festival), otherwise Shoki will get angry and cause trouble. So on this day people have to take special care of fires in the home. In the compound of 若宮八幡宮 Wakamiya Hachimangu. This shrine has been erected by students and teachers of the Kyoto University Art and Design 京都造形芸術大学. The Komainu guardians are Shoki himself.